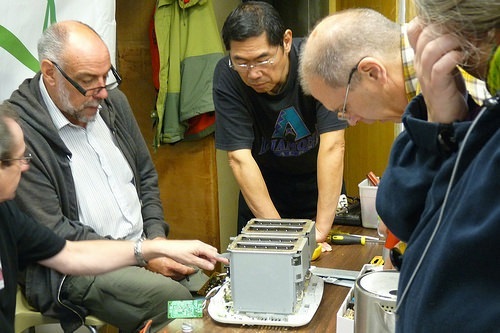 Popular “Repair Cafes” Build Community and Global Sustainability: Who Can Argue with That? If you are like me, you have a number of gadgets that have given up the ghost but which look fixable if you only knew what to do—and besides, throwing it away will further doom the earth. The end result is that pink toaster on my counter that has not toasted for nigh on a year. In Philadelphia, the Philly Fixers Guild has started volunteer “repair fairs” where they will help you fix your stuff. At one of the more recent events, attendees traveled from miles around, bringing their temporarily defunct heaters, stereos, and kitchen mixers, about half of which got fixed right then and there. Repair Cafes were developed by a Dutch nonprofit as part of a “circular economy” movement and they caught fire internationally with more than 700 operating worldwide. The New York Times wrote the phenomenon up a few years ago. Ron Bail of Westmont, New Jersey, has 30-plus years of mechanical and electronics experience, but even he is sometimes stymied, saying that some things are not made to be fixed. But even if you don’t walk away with a working pink toaster, presumably you know a bit more about how the #$*&! works—or doesn’t—because you are hanging out with your fixer guy or gal. A survey of nonprofit and philanthropic leaders finds that despite myriad challenges there are a number of areas where equity is being advanced in urban communities.